Now that we've got a couple of dual-core devices with those fast-and-mighty NVIDIA Tegra 2 chipsets, it's time to put them to good use -- with some apps. And to that end, NVIDIA this morning has launched Tegra Zone, a portal for finding the latest apps optimized for the new processors. We've taken Tegra Zone for a spin over the past couple of days. Join us after the break for a full rundown. Great. Another app store, right? Actually, no. In a nutshell, Tegra Zone is a portal to showcase applications that are optimized for the Tegra 2 processor. No more, no less. 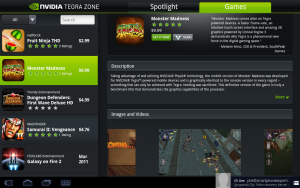 Tegra Zone has two sections -- Spotlight, and Games. Spotlight has a handy carousel of apps, with pricing prominently displayed. You get a short summary, start ratings, and a "Get it now" link. Tap the app, and it takes you into the Games section. There you get a longer description of the app, screen shots and videos, and a pull quote from game reviewers. There's a link to share the app page through Bluetooth, Gmail, or any connected social networking apps. Clicking the "Buy" link takes you to the Android Market. And that's the way we like it. You don't have to sign up for anything. You don't give your credit card information to NVIDIA. No extra usernames or passwords to remember. All in all, Tegra Zone's doing something the Android Market (even the newfangled tablet version) still largely fails at -- making good apps easy to find. Santa Clara, CA — Mar. 1 2011—NVIDIA announced today that the Tegra Zone™ app is now live on the Android Market, providing a one-stop destination for consumers seeking the richest games for their super phone or tablet powered by the NVIDIA® Tegra™ 2 mobile super chip. The free app delivers a curated selection of Tegra processor-optimized games, as well as professional game reviews, high res screenshots, HD video trailers, gameplay videos and behind-the-scenes featurettes. Sale and delivery of users’ selected games are completed using Google’s Android Market. Games on Tegra Zone apps are especially enhanced for Tegra 2 super chip-powered devices, and are more realistic and interactive Among those selected as launch titles are Dungeon Defenders: First Wave Deluxe HD the first game available for Android that’s built on Unreal Engine 3; Samurai II: Vengeance and Galaxy Fire on 2 THD. A complete list is provided below. Introduced over the past several months in a variety of super phones and tablets, the Tegra 2 super chip is finding a growing market, particularly among those interested in console-quality gaming on their mobile device. It is built with the world’s first mobile dual-core CPU – which unleashes the best Web experience, with up two times faster browsing and support for full Adobe® Flash® Player hardware GPU acceleration, plus unprecedented multitasking capabilities. It also includes an NVIDIA GeForce® GPU – which provides stunningly rich visual experiences and console console-quality gaming. Samurai II: Vengeance by MADFINGER Games: A hack-and-slash action game with stylized manga graphics and quick, bloody gameplay. On par with console with 3D brawlers, Samurai II: Vengeance takes advantage of the raw processing power of Tegra 2 with four times more texture resolution on characters, increased geometry for more realism, and completely redesigned knockdown moves. Dungeon Defenders: First Wave Deluxe HD by Trendy Entertainment: Combines the depth of strategic gaming with the satisfying action of RPG character building, in a beautifully stylized cartoon fantasy setting. The Tegra-enhanced version includes dynamic lighting schemes and advanced post processing post-processing effects, as well as the same number of maps and game play levels on PC and Sony PlayStation 3 (PS3) versions. Due to the graphics capabilities of the Tegra 2 processor, players can join in multiplayer, cross-platform games across super phones, tablets, PCs and the PS3.